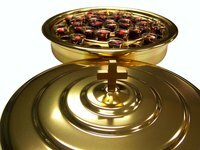 How Much Money Should I Give as a Communion Gift? Children taking their First Communion are often given gifts by friends and family. These gifts can commonly include money. Specific denominations will generally vary between families, based on the economic standing of the family and their value system. Check with the child's parents about a denomination they consider appropriate. The size of the gift should also depend on your relationship to the child receiving the gift. Family friends should generally give less money than relatives. Also, close relatives, such as grandparents, should give more money than distant relatives. According to Leah Ingram, author of the "The Everything Etiquette Book: A Modern-Day Guide to Good Manners," friends of the child commonly give from $25 to $50, while family members give gifts of at least $100. How Much Should I Pay for Beef Tenderloin by the Pound?